GENEVA — Automobili Pininfarina's Battista electric supercar will hit the market next year, with production limited to up to 150 units. The model will be "the most powerful road-legal car ever designed and built in Italy," said Automobili Pininfarina CEO Michael Perschke. The Battista will have a 120 kW lithium-ion battery pack driving an electric powertrain with up to 1,900 hp and 2,300 Nm of torque. The car will reach a top speed of 350 kph (219 mph) and accelerate from 0 to 100 kph (62 mph) in less than two seconds. At street speeds, the Battista aims to have a driving range of 450 km (281 miles). According to a company release, all these data are “target estimations” subject to confirmation. The Battista debuted at the auto show here on Wednesday. The name of the Battista comes from Battista "Pinin" Farina, the founder of the original Italian Pininfarina company. The current Automobili Pininfarina, based in Munich, is a fully owned subsidiary of the Indian conglomerate Mahindra & Mahindra. 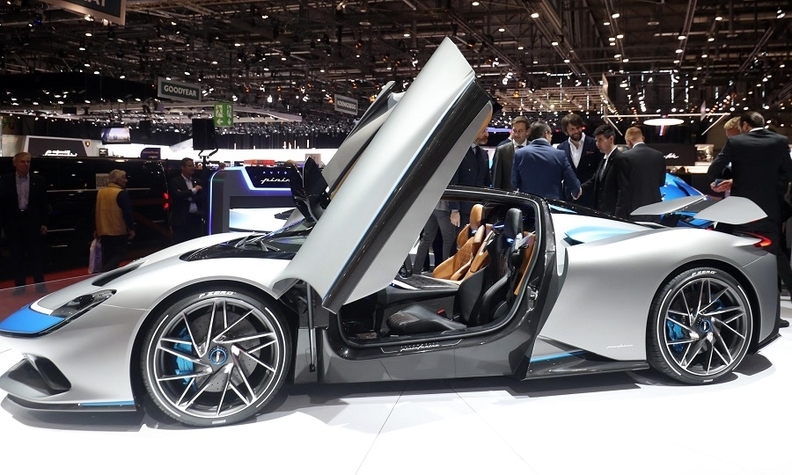 Automobili Pininfarina licenses the Pininfarina name from Turin-based Pininfarina SpA, which is in turn majority-owned by Mahindra and will continue to operate independently from Automobili Pininfarina. The Battista will be assembled at Pininfarina SpA’s design and engineering center in Cambiano, near Turin. Pininfarina will use its special-project department, which also builds one-off models for Ferrari, to assemble the Battista using a carbon-fiber monocoque body. Croatian startup Rimac Automobili, which specializes in superfast electric cars, will supply the high-performance electric powertrain and battery technology. The Automobili Pininfarina development team is led by Chief Technical Officer Christian Jung, who has worked at BMW, Porsche and Faraday Future. Joining him as senior technical adviser is Peter Tutzer, who has worked at Porsche, Pagani and Bugatti. The team also includes former Formula One and Formula E driver Nick Heidfeld.